Just a quick post on a scarf I finished this weekend. I’ve been on a mission of completing unfinished projects. I’m always preaching to my kids about finishing what they start so I guess this mama needs to start practicing what she preaches, right? LOL! I started crocheting this scarf many years ago. This is a terribly annoying habit I need to break. I guess I tend to get so involved in a hobby and then I get distracted and move on to something else. To put it plainly I love all things crafts whether it’s paper crafts or needle crafts…I just like keeping my hands busy period. I have a basketful of blankets that I want to complete and give them to the people they were intended for. I shared that “special blanket” story a couple of weeks ago, now I have another special blanket I need/want to finish for my youngest daughter Nicole. Doesn’t seem fair that Lindsey has one and not Nikki. So now that I’m done with this cute scarf, Nikki’s pink blanket is next on my list. It’s going to be a big one so it may be a while before it’s finished. I’ll post of picture of it soon so you can see the stitch I’m using. . 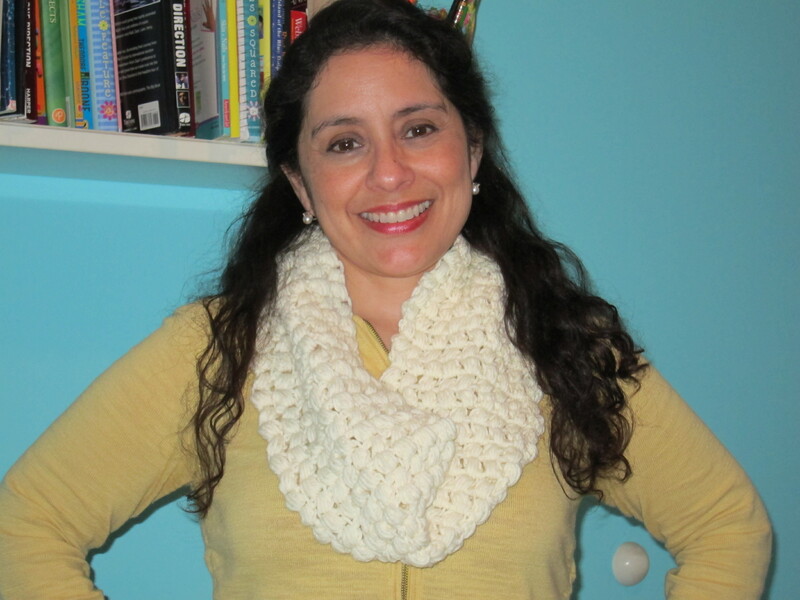 Here I am modeling the cowl scarf I made. I don’t know what this stitch is called or where I learned it but if anyone is interested in a video tutorial, please let me know by leaving a comment. I’ve never made a video tutorial on anything but have been thinking about putting one up on YouTube just for fun. Pink and Red Crocheted Hearts – Valentine’s Day crafts .